New Item! Expected to Ship 04-29-2019. 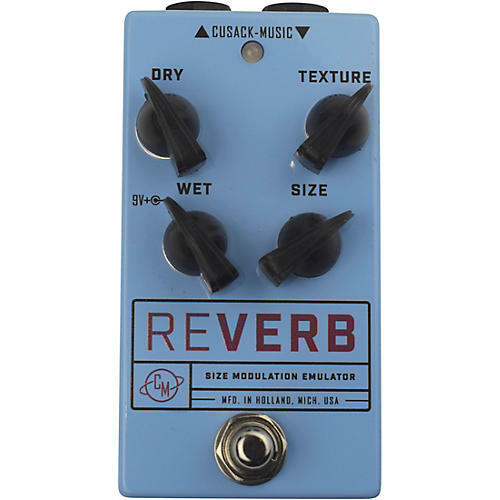 The Cusack Music Reverb goes from a little springy to a giant cave with the twist of the size knob. Separate wet and dry controls allow for as much, or as little, of each signal as you want. Also featured are a texture knob to adjust the tone of the reverb signal, and of course our true bypass switching system. Note: due to the current draw of the Cusack Reverb (~60mA), Cusack Music does not recommend powering it with a battery. They are no longer shipped with batteries, nor battery snaps. Dimensions: 4.42" x 2.39" x 1.24"